Coleford is based on a real railway in the Forest of Dean, with history having been warped a little to suit a "narrow" (gauge) mind. The railway from Coleford to Monmouth had its origins as a 3' 6"gauge plateway, the Monmouth Tramway carrying coal, clay and lime to the river Wye at Monmouth. But it's been reinvented as a 2' gauge railway serving a quarry, gold processing and a chocolate factory. You'll have to ask for the history! I wanted to design something that was portable and not large. At the same time, I wanted something that was interesting to operate. I have always been a fan of unusual trackwork. On Coleford, there are two different types of track; stone based chairs, and longitudinal sleepers. I used and abused commercially available track to construct these. The locos and stock are a mixture of bought, kit built and scratchbuilt, including some very unusual locos. Some of the stock is quite unusual too - look out for the chocolate waggons. 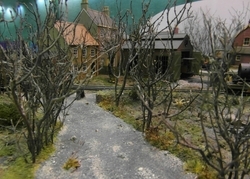 The scene shows the railway is a fairly run down state in the depths of winter. So there are lots of bare trees and all the people look miserable!. 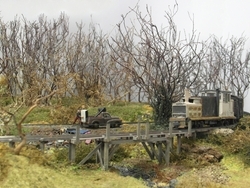 The layout featured in the May 2013 edition of the Railway Modeller and the Decembber 2018 of Model Rail. 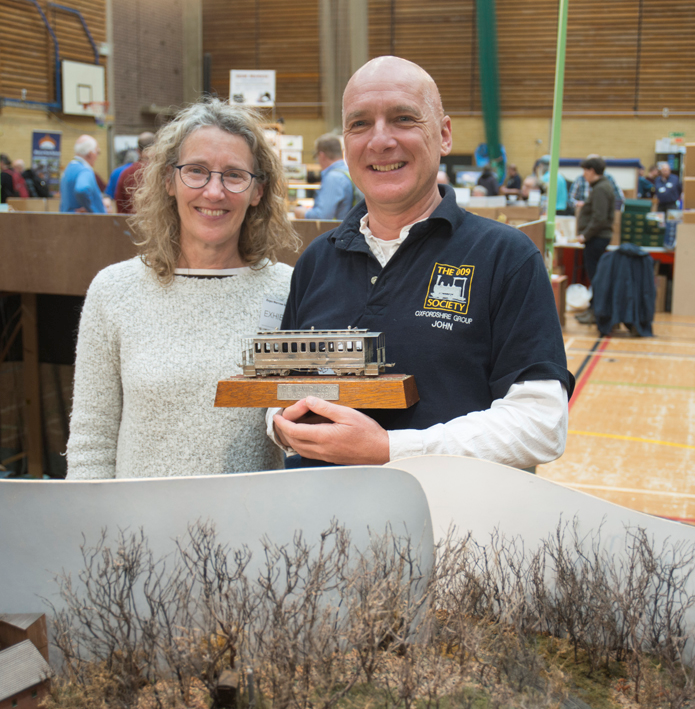 The layout won the David Lloyd Memorial Trophy at ExpoNG in 2018 (photo by Andrew Burnham). John has also written a book on his experiences building his layout and you find find details here. To see full size pictures click here to go to the photobucket album for Coleford. If you are interested in having Coleford at your exhibition then here is some useful information for exhibition managers. To contact me please use the contact box at the top of the screen.